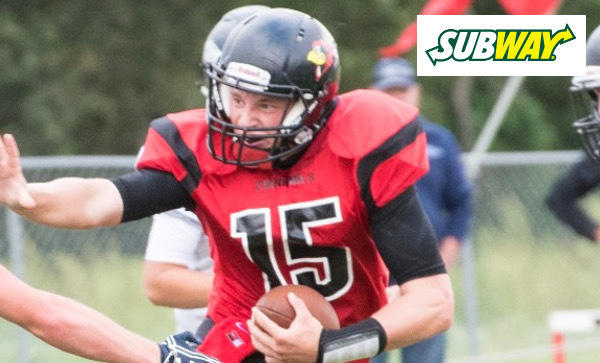 The Kansas high school football season is officially underway and we are excited to once again have Subway on board to sponsor our Friday Fresh Take where we provide our initial reaction to some of the most notable games and performances in the state each week. It was quite an opening night as eight teams that played for a state title last fall lost – including three defending state champions. In all, twelve teams ranked in the Kpreps rankings dropped their opener. That may seem like a lot, but it isn’t unusual as teams introduce inexperienced players to the Friday Night Lights atmosphere. A year ago, eleven ranked teams lost in the opening week, including three top-ranked teams. Let’s take a look at some of the more notable results from Week 1. Last season, Marysville held a 20-14 lead in the fourth quarter before allowing Rossville to tie the game and eventually score in the final minute to escape with a 27-20 victory. On Friday night, Marysville built a 36-7 halftime lead in flying past the three-time defending 3A champs, 52-13. Senior quarterback Jack Blumer passed for 316 yards and six touchdowns while throwing only two incompletions. Wideout Gabe Pieschl caught six balls for 192 yards and four of Blumer’s touchdown passes. Expectations were high for St. James Academy entering the 2016 season, but Mill Valley silenced the Thunder in last year’s opener with a 35-13 victory. On Friday, St. James sent a shockwave across the 5A landscape with a 45-21 victory over the two-time defending 5A champions. The Thunder forced five Mill Valley turnovers and turned a 17-14 halftime lead into a 45-14 rout until the Jaguars added a late touchdown. St. James running back Jack Petz rushed for 125 yards and three scores the lead the Thunder. Pittsburg High used a strong opening performance from senior quarterback Chase Curtis to upset Harrisonville, 37-21. The Wildcats are defending state champions and were ranked No. 2 in Missouri’s Class 4 entering Friday’s action. Pittsburg opened the scoring with a touchdown pass from Curtis to Dylan White for a 7-0 lead. Harrisonville would respond in the second quarter with a touchdown run by Joe Bowers to pull within 7-6, and after a Pittsburg fumble, would take the lead on a touchdown pass from Ryan Byrd to Colby Knowles. White would haul in another Curtis pass and run down to the 2-yard line to set up a touchdown run by Brandis Evans giving the Dragons a 14-13 lead. The Dragon defense then forced a fumble, and Curtis connected with White on an incredible 29-yard TD catch to put Pittsburg up 21-13 at the half. Pittsburg extended its lead in the third quarter on a Curtis touchdown pass to Jhalani Long, and Nathan Neef added a 34-yard field goal for a 30-13 lead mid-way through the fourth quarter. Curtis would later add a TD run for a 37-13 lead before Harrisonville would tack on a late score. Curtis passed for 260 yards and three touchdowns on the night. He was forced to leave last season’s opener at Harrisonville in the first quarter and the Dragons went on to commit six turnovers in a 28-7 loss. White, a junior, hauled in eight passes for 160 yards and two scores. Ell-Saline won the Heart of America League opener against 2-1A No. 5 Sedgwick 31-21. The battle between the two sets of Cardinals was voted on by the fans as the Kpreps Game of the Week. Ell-Saline held a slim 14-7 lead at halftime behind a pair of Nick Davenport touchdowns. Sedgwick tied the game at 14 in the third quarter. After Ell-Saline regained a 7-point lead, a Sedgwick turnover led to a Cardinal field goal and a 24-14 lead. Sedgwick would pull within 24-21 before Davenport scored again to deliver the 31-21 win for Ell-Saline. Bishop Miege dominated Blue Valley 55-10 on Friday to end a two-game losing streak to the Tigers. Miege entered the opener with fewer question marks given the Stags returned several talented players including two-time all-state quarterback Carter Putz. Blue Valley entered with a very inexperienced team and a large emotional hurdle to overcome as the Tigers took the field for the first time after the death of coach Eric Driskell from a brain aneurysm in February. Miege quickly turned a Tiger fumble into points as talented sophomore back Brison Cobbins scored on a 25-yard touchdown run. Late in the opening quarter, Jasir Cox returned an interception for a score and a 14-0 lead. Cobbins would provide the big play in the second quarter on a 98-yard touchdown run after a Blue Valley punt pinned the Stags deep against their own end zone. Blue Valley would get on the board with a field goal, but Miege would respond before the half with a pair of Carter Putz touchdown passes to lead 35-3. The Stags added a special teams score in the third quarter as Cameron Key returned a punt 80 yards for a score, and Cameron Key added a touchdown run from midfield as the lead ballooned to 55-3. It was almost as if the script to last season’s opener was flipped. McPherson built a 19-0 lead at halftime and withheld a Buhler rally to knock off the No. 2 Crusaders, 33-21. Quarterback Kyler Hoppes tossed a touchdown pass to Ben Nikkel, rushed for a short score, and connected on a 50-yard screen pass to Tayln Huff just before half to put the No. 4 Bullpups up 19-0. Buhler would score a pair of touchdowns in the third quarter to close the gap to 19-14, but McPherson would score again before the quarter ended to extend its lead to 26-14. In last year’s opener, Buhler jumped out to a 14-0 first-quarter lead and held off McPherson, 26-13. Topeka High sophomore running back Ky Thomas rushed for 242 yards, five touchdowns, and returned a kickoff 95 yards for another score to lead the Trojans past 4A-II No. 1 Topeka Hayden, 61-46. Topeka led 34-18 at halftime, but Hayden rallied in the third quarter to get within single digits twice. The Trojans continued to come up with an answer on a night when they piled up more than 550 yards of total offense. Highland Park transfer Da’Vonshai Harden accounted for more than 300 yards of total offense for the Trojans. Harden rushed for a touchdown and threw a pair of touchdown passes. Hayden was led by quarterback Sampson Huston’s 250 passing yards and four touchdowns. He connected with returning all-state wide receiver DeShawn Hanika for 122 yards and three scores. Matt Pauly connected with Jared Becker on a 45-yard touchdown pass with 2:56 remaining to propel Garden Plain to a 28-24 win over Hesston. The win was the Owls’ sixth consecutive against the Swathers in recent history. Garden Plain entered the fourth quarter with a 14-12 lead before a Parker Roth touchdown run put Hesston up 18-14 with 9:23 to play. The Owls responded as Kaleb Snyder broke free for a 28-yard score and a 20-18 lead. Roth would answer again with a 52-yard run, his third touchdown of the game, to put the Swathers up 24-20 with 3:37 left. Less than a minute later, the Owls had answered when Pauly connected with Becker with the winning score. Garden Plain rushed for 312 yards in the game led by Nick Dooley’s 147 yards and a touchdown. Snyder added 91 yards and two scores. Roth led Hesston with 181 rushing yards and three scores, while Cameron Cox passed for 262 yards and a touchdown. Defending 4A-II champion Pratt opened the new season with a scare, but outscored Larned thanks to a huge night from junior Travis Theis. Thies rushed for 412 yards and six touchdowns as the Greenbacks topped the Indians 56-46. Pratt and Larned combined for 81 first-half points as the Greenbacks led 42-39 at the break. Amazingly, that score held throughout the third quarter. Kadence Riner returned a Larned fumble for a touchdown to extend the Pratt lead to 49-39 early in the fourth quarter. Theis then added a short touchdowns run to put the Greenbacks up 56-39, and Pratt was able to hold on for their ninth consecutive win. Conway Springs put up more than 700 yards of total offense and 98 points in beating Belle Plaine 98-18. While there is no doubt that score will be the topic of debate this week, Conway Springs threw only one pass in the game. Instead, the Cardinals kept the ball on the ground – as Conway Springs does – and produced three backs with more than 150 yards rushing. Conway Springs led 66-12 at halftime. Congratulations to the Wetmore Cardinals for picking up the school’s first varsity football victory in more than 30 years with a 60-18 win over Valley Falls. Wetmore kids have participated in football at surrounding schools since the mid 1980’s, but restarted the school’s program at the 8-man level last season. Jayhawk-Linn scored on a 22-yard touchdown pass on the game’s final play to shock Neodesha, 28-26. The Jayhawks held a 22-19 lead mid-way through the fourth quarter before the Blue Streaks scored with 30 seconds remaining to take a 26-22 advantage. After the ensuing kickoff, Jayhawk-Linn took over at their own 40-yard line and threw a long pass down to the Neodesha 22. The next play resulted in the 22-yard touchdown to win the game as the clock expired. Meanwhile, after a long lightning delay, Lakin and Hugoton resumed play well after 11:00. If that wasn’t enough, then game went into overtime… and a second overtime… and a third. Neither team could score in overtime until Lakin pushed across a touchdown and two-point conversion in the third OT and held Hugoton scoreless for a 28-20 win. The past two seasons, Wichita Northwest had kept the offensive pressure on and found a way to outscore Bishop Carroll. In Thursday’s opener, it was Carroll that found a way with a late touchdown that delivered new head coach Dusty Trail his first victory. Trailing 35-34, Bishop Carroll’s Desmond Smith scored on a 10-yard touchdown run with 14 seconds left to give the Golden Eagles a 40-35 win. Carroll quarterback Braden Howell accounted for nearly 400 yards on the night to lead the Eagle offense.